James “Whitey” Bulger is a bad man. Murder, extortion, narcotics and money laundering are just part of his rap sheet. For decades (when he wasn’t doing time at Alcatraz), Bulger was running the south side of Boston under the nose of the Italian mob. Getting drugs into the hands of Boston’s youth, exporting illegal arms to the people’s rebellion in Ireland, and killing anyone who might set off his sensitive paranoia, all while eluding capture by the FBI. Perhaps though, as BLACK MASS points out, eluding is the wrong word. 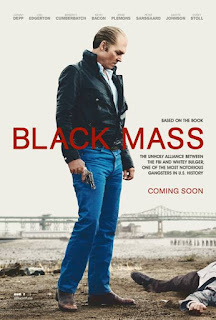 BLACK MASS tells us two tales over the course of three decades: one of Bulger’s activities, and the other of corruption within the FBI. Federal agent John Connolly, a childhood friend of Bulger, believes loyalty is everything - even if your job title requires arresting guys like Bulger. Connolly convinces his colleagues at the FBI to use Bulger as an informant; the FBI turns a blind eye to Bulger’s dealings in exchange for information that would help take down his enemy, the Italian mob. Connolly is intoxicated by Bulger’s acceptance, something not easily won, and Connolly’s corruption within the bureau allows Bulger to do his worst. While Connolly stalls the FBI from looking into Bulger, Whitey and his gang partake in every illegal prospect possible, becoming rich in the process. BLACK MASS gives us glimpses into the tragedies Bulger suffered in his personal life during this time period, but the film never asks you to sympathize with Bulger, a man who would just as soon bury you under a bridge as help you with the groceries (both of which he does). Just six years after starring as John Dillinger in PUBLIC ENEMIES, Johnny Depp tackles another American criminal mastermind as James “Whitey” Bulger. Depp transforms into the Boston gangster in every way. Makeup artists make it nearly impossible to spot Depp, and it’s refreshing to see him get so completely lost in a role, particularly after an inconsistent half-decade (MORTDECAI, THE TOURIST, THE LONE RANGER, DARK SHADOWS, and did I mention MORTDECAI?). Hopefully gone are the days of being stuck to every Tim Burton CGI-fest. While Depp remains popular, in part because of his hugely successful PIRATES OF THE CARIBBEAN franchise, BLACK MASS reminds us of the depth of Depp’s talent. It’s impossible to miss how completely entrenched he is in Bulger. Under his thinning blonde hair and piercing blue eyes, Depp transfigures and gives us perhaps his best performance since 2001’s BLOW (though I did love his cameo in Kevin Smith’s TUSK). His take on Bulger is never less than engaging and always deeply menacing, even if restrained for most its two-hour running time. The cast is incredibly well rounded, and as a result, so are the characters. It doesn’t take long to get to know any of our players. Joel Edgerton - who just came off of writing, directing and co-starring in the fantastic THE GIFT - plays the crooked FBI agent, Connolly. Edgerton strikes all the right notes as Bulger’s Fed-friend. Many of the supporting roles are brief, but effective. Benedict Cumberbatch plays Whitey’s brother, Billy, a Massachusetts State Senator. Peter Sarsgaard is a strung out and twitchy accomplice. Jesse Plemons (BREAKING BAD) is Bulger’s trusty handy man. Kevin Bacon and Adam Scott serve as higher ups at the FBI. The list goes on and on with heavy hitters, but it’s simpler to say, everyone earns their check on BLACK MASS. If BLACK MASS struggles, it’s in the fact that it offers nothing new to the mob-genre and is weighed down by a sluggish script. While it keeps the audience's interest, it’s never as thrilling or gritty as one might hope. Depp himself admitted last week on Jimmy Kimmel’s show that he fell asleep 15 times during a screening. You won’t find yourself falling asleep, but you won’t be hooting and hollering from excitement either. The best thrills are sequences in which Bulger intimidates those around him, wearing them down with crushing words and imagery, not the inevitable shot to the head. BLACK MASS, much like Bulger himself, is slow moving and calculated. Unfortunately, at times the tone and pace feel more like restrictions for a good movie that’s dying to be great. Slow and steady seems to be a pattern for director Scott Cooper, whose past films include the indie gem CRAZY HEART and 2013’s gritty, albeit underwhelming, OUT OF THE FURNACE. I can say that every element of the filmmaking is top notch like cast.Proof that even after all this time, audiences haven't even begun to see everything that Johnny Depp is capable of.